The sea never fails to refresh anyone. Whatever your mood is, the sea has the ingredients to attend to it. You might be feeling sad, happy or nothing at all. But, visiting the sea seems like a fit at any time. The time at the sea gets even better when you have something to do. And, thereby, rises the need for the sport of surf fishing. While it is mostly the fishes available there that lures you to surf fish, some of the credit goes to the ever-alive waves and aura of the sea itself. You may feel more alive by taking fishing into a more aggressive and interactive standard. Because surf fishing is not as easy and relaxing as other kinds of fishing. The aggressive waves make the species living there aggressive and strong as well. Apart from that, there is the salt water and salty air to accompany it all. In order to enjoy and to be skilled at surf fishing, you cannot go alone. You need a good partner to fish and that partner is your surfing rod with its surf fishing reel. The reel, in fact, is what makes the rod functional and in order to get the best result, you have to make sure you have the best surf fishing reel. 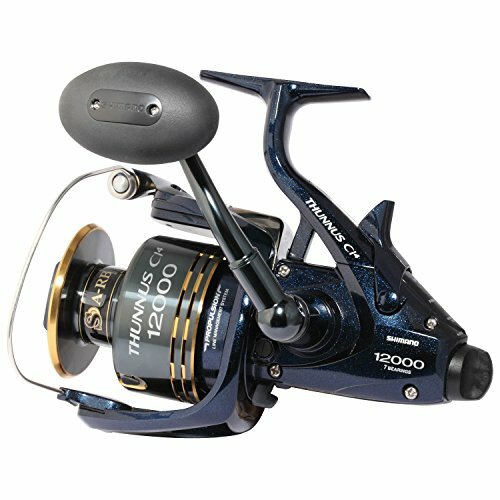 However, choosing ​this fishing reel is not easy because there are so many reels with different features available. As a result, we are here to give you a better, more focused view of the surf reel world. 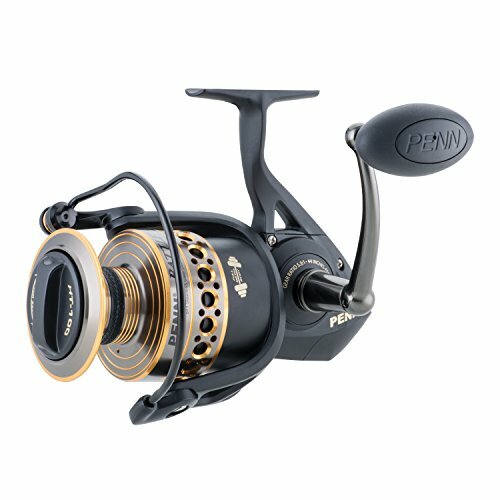 If you are not sure if you will be into surf fishing but want a quality yet affordable reel, to begin with then, this Penn Battle II is the right reel for you. In fact, you will not expect the performance and quality this reel will provide you with at this price point. It deals with the rough and tough seawater with the same toughness with its heavy-duty aluminum bail wire. Therefore, you also get the durability you need to surf fish regularly. The carbon fiber drag system will not disappoint you either. Apparently, it provides you with the strength to deal with those strong fishes. Furthermore, you will not face much resistance from the reel itself. 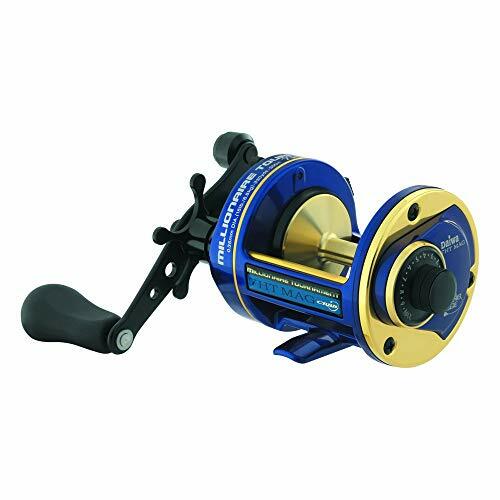 There are five stainless steel ball bearings that keep you and the reel moving smoothly. However, a few customers complained about the reel locking up and never being functional again. Other than that, the reel never fails to delight you. Even its rubber knob is super comfortable to deal with. 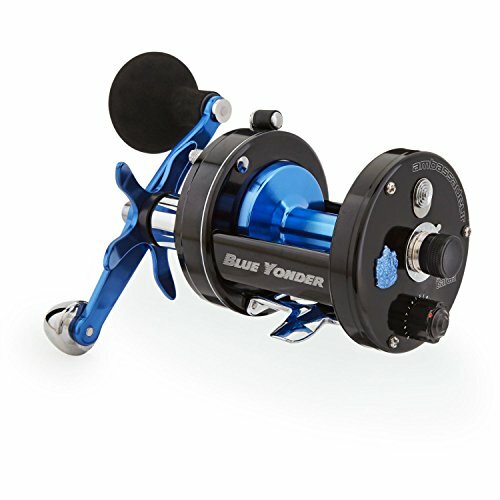 So, if you are looking for a reel that will accompany you as a strong support during your beginner stage then this is one quality, affordable and smooth reel to have. ​​​The aluminum bail wire keeps it durable. ​​​The carbon fiber drag system is not just strong but also smooth. ​​​​Ball bearings help the overall smooth functioning of the reel. ​​​​The line capacity is well marked for guidance. ​​​A few customers complained that the reel gets locked up. Are you looking for the reel that will provide you with the smooth strength you need? The Quantum Cabo PT is something you can consider in this case as there are rare complaints about its strength and smoothness. Anglers have nothing but good things to say about this strong and durable reel. In fact, this reel is best for tarpon fishing. Firstly, this reel is loaded with PT technology and features a sealed magnum CSC drag system. You can expect nothing but a smooth and strong drag system from a strong and smooth reel. That is unless you receive a defected product which a number of customers received. 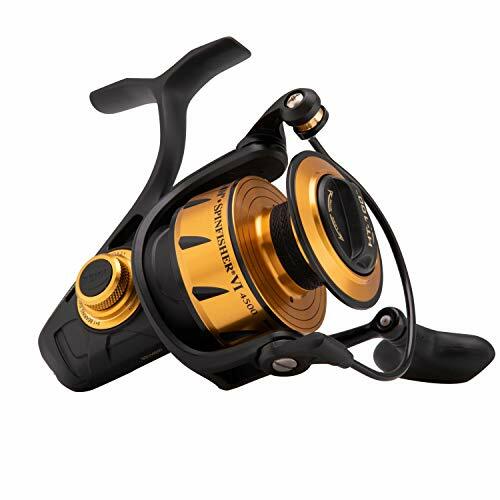 The reel also features a sealed magnum clutch and TiMag fail-proof titanium bail system. These components make this reel durable and strong enough to handle the rough sea and its rough species. Moreover, it features an LMS line management system to keep trouble related to line away from you. However, a few customers complained about getting birds’ nests for no apparent reason so we can’t exactly ensure the functionality of the system you might receive. The reel is quite lightweight making it comfortable on your hands. So, you can spend quite some time surf fishing with it. It has a maximum drag of 45 lbs and has a line capacity of 300 yards. So, you will not be disappointed in terms of capacity, strength or quality of this reel for the price you buy it at. ​​​Smooth and strong drag system. ​​​​Lightweight and comfortable to use. ​​​A few customers complained about the drag coil not working. ​​​​Some faced problems with line management. With Penn grabbing both our first and third positions, it should leave you with no doubts about the quality of the reels that this brand produces. Apparently, this reel does not just use materials that will resist damage by the rough sea but also has a design and build that keeps everything in place despite the pressure on the reel. Firstly, the reel has a full metal construction with a techno based rotor and aluminum bail wire. This helps the reel resist the effects of saltwater on it. Moreover, the reel also has mechanisms to keep its initial gear alignment in the face of strong impacts. Apart from that, it has a watertight sealed design that keeps it protected from the saltwater as much as possible. This allows you not just to fish from the shore but get deeper into the sea as well. You do not have to worry about the strength either because its Sealed HT-100 Slammer drag system provides you with not just the right amount of strength and durability but also a smooth operation that you cannot forget. In fact, the smooth operation of the overall reel is enhanced by the five shielded stainless steel ball bearings. You won’t have to worry about using the right line either because it features marked line capacity rings. Casting with it is easy and smooth as well and you can cast far. On top of it all, you get to enjoy all these at a very reasonable price. There are many brands that offer the same quality and functionality demanding a lot more. ​​​Great design and build that keeps it strong and stable against pressure. ​​​​Strong and smooth drag system. ​​​​Watertight design protects it from the rough environment. ​​​​Casts really far and smoothly too. ​​​Not the most durable as many customers complained about it getting damaged too easily. Do you want three ‘S’ words to keep you happy? Then, SHIMANO THUNNUS CI4 can make you happy with its three 'S' words! Apparently, the words that will have your back are strong, silent and smooth. This is what you require from any reel and the CI4 provides you with it all. It provides you with the strength to gallantly deal with sea fishes with its carbon fiber drag system. This not only provides the reel with strength but also protects it. Because carbon fiber does not rust and can handle the sea environment well. Apart from that, you will enjoy using it because of all its adjustable features and ease of use. It’s a bait spinning reel after all! It is both lightweight and simple. Moreover, it also features a propulsion line management system that manages the line in a way that you can cast farther. Moreover, you do not have to worry about backlashes and wind knots either as it prevents those occurrences. You will able to fish at consistent speeds because of the Varispeed technology that this reel features. Apart from that, the Dyna balance features make it wobble-free by counterbalancing the rotor. The reel feels solid to hold and performs in a way that you will not be disappointed. ​​​​It is as strong as it wants to be. ​​​​​Good quality, efficient materials used in the builds. ​​​​​The line management system makes operation trouble-free. ​​​​​​Casting performance is satisfying with the good distance it covers. ​​​​​​​Has consistent speed and is stable. ​​​​​​​Comfortable and easy to use. ​​​​The trouble with bait runner switch after some time. 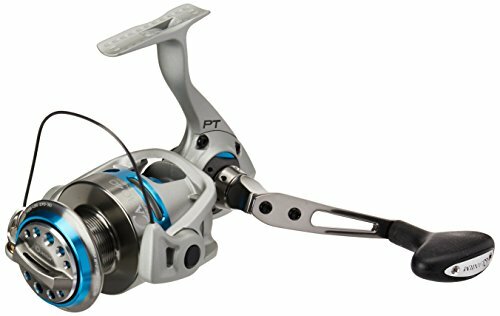 Penn is back again with its quality and efficient reel on our list! 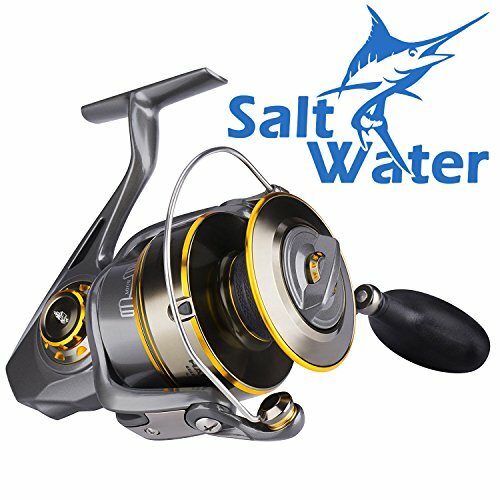 If you are a beginner and do not want to spend much at all on a reel but still want to just surf fish with whatever you get, this reel is something you can try out. The reason is that it is not just very cheap but of good quality and functionality as well. What it will do is bring your faith and interest in surf fishing so you will come back for more and never give it up. 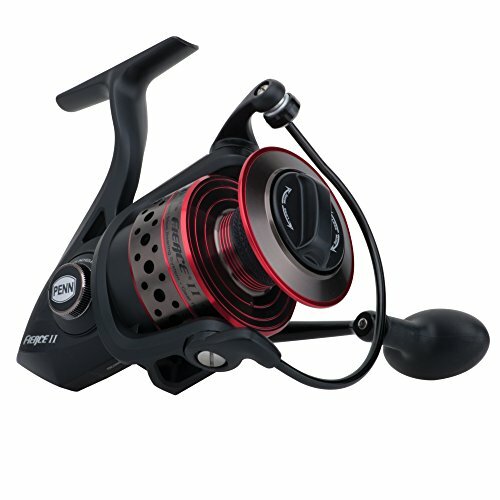 In fact, this reel is quite good to look at as well with its black and red sleek design. Moreover, it has a full-metal body and side plates that do not just make it strong and sturdy but also keeps the alignment in place even under heavy loads. You get a number of capacities or strengths to choose from which makes this reel even more worth it because you get exactly what you need. Furthermore, you will find the reel very smooth to use because of the 4+1 shielded stainless steel bearings and an anti-reverse bearing. All its parts including the heavy-duty aluminum bail wire make it suitable and durable enough to be used in sea water. Some customers faced trouble with the drag, live liner, and the bail. Otherwise, everyone loved the reel for what it offers at such a cheap price. ​​​​​Full- metal good quality parts construct the whole reel. ​​​​​​Ball bearings to make things smoother. ​​​​​The drag might not be the most durable and may malfunction. ​​​​​The bait may cause trouble midway causing losses. ​​​​​​Live liner tends to cause trouble as well. When you are surf fishing, the distance and speed of your cast really matter. So, if you are on the lookout for a reel that will provide you with a great casting distance that too at a great speed, this is the one. In fact, it will do with speed as its gear ratio is 5.8:1. Moreover, the high speed does not increase the chances of mistakes in this case. For the most efficient and effective performance, the reel features a magnetic brake that prevents overrun when the reel approaches maximum speed. This also helps the spool to spin longer and build speed faster. Moreover, you can completely adjust the control level according to your specific needs. The reel is made of aluminum alloy which keeps it fine in the sea conditions. It also has brass and stainless steel parts with aluminum frames and side plates to keep it durable. You will enjoy using it for the comfort it provides with its lightweight which is also a contribution of the lightweight carbon swept handle. The infinite anti-reverse features keep it working smoothly too. However, just one customer complained that this reel is not great for big fishing due to its drag and absence of a clicker. But, others only have nice things to say about this reel. ​​​​​​​Resistant to damage by sea water. ​​​​​​​Good quality parts made with high-quality materials. ​​​​​​May not be the best for big fishing. This is another reel that will help you cast really well and smoothly too. Furthermore, it is suitable for the sea because of its corrosion-resistant builds. Although it is a baitcasting reel you do not have to try too hard to figure out how it works or get a grip over it. It allows you to deal with a number of types of lures but when it comes to strength, it will not provide you with the best. Apparently, this reel features a Carbon Matrix drag system. This provides you with a smooth and consistent drag. Furthermore, it features a MagTrax brake system which lets you keep a control over the speed of the spool. Now you can guess why the reel is great for casts. While it has the right features to help you cast perfectly, it also gives you adequate control over your casts (Just the way a baitcasting reel should). The handles also help you fish as easily as possible. 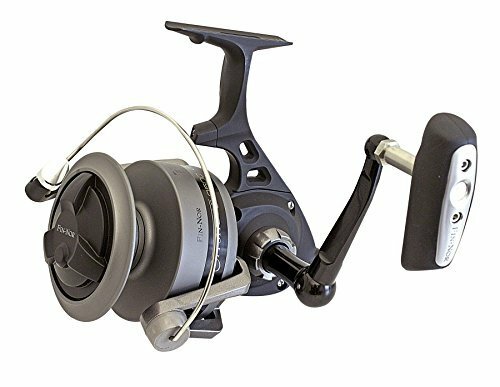 In fact, it features extended bent cranking handles and a power knob so you have a good control over your reel to do anything you want with it. But, you do have to spend a little bit more than you do on spinning reels. ​​​​​​​Casts really well, far and smooth. ​​​​​​​Provides the angler with good control over the cast with the braking system. ​​​​​​​Smooth and consistent drag system. ​​​​​​​​Able to handle the sea weather. ​​​​​​​​Allows usage of a number of types of lures. ​​​​​​​A bit pricier than other reels. ​​​​​​​​Might not have the best quality. ​​​​​​​​​Not very strong in case of drag power. Looking for a reel that will not just help you cast but also provides you with ample strength to land the bigger species? The HaiBo reel is one such reel that does not cost much but will provide you with these. Apparently, it has an all-metal build with corrosion-resistant parts. You do not have to worry much about exposing it to the sea environment. It uses CNC technology and has a mechanically sealed drag system. The maximum drag is what will amaze you, it is 61.7 lbs. So, neither the sea waves nor the sea fishes will be a problem, right? Then, there is the casting performance. You get to cast really farther than you expect and very smoothly. There are six stainless steel ball bearings to back you up on smoothness. The side plate maintains the perfect gear alignment and the Dura-Drag prevents saltwater infiltration and corrosion. In conclusion, the reel will give you a much better service than what you expect at the price point. It does have its cons but most are pros. ​​​​​​​​​Features an all-metal body with corrosion resistant parts. ​​​​​​​​​​Might not be the most durable as some parts of it may be affected by saltwater. Are you looking for a reel that will accompany you through tough surf fishing situations and bring you out victorious? Then, this is the reel you are looking for. You just have to spend a bit more and you will get exactly what you need. Apparently, this reel features a stainless steel/oil felt drag system with a carbon fiber braking system. The drag system provides you with a consistent drag pressure, smoothness and also corrosion resistance. Furthermore, the braking system provides you with safety and control over your casts. You will enjoy a maximum drag power of 55 lbs. with this reel. It has a patented parallel winding design and looks really nice. What you might have trouble with is the quality and build material. While the brand mentioned that the parts are all metal, some customers complained that it has plastic parts or is completely plastic. Other than this, there is nothing else that disappoints the anglers using it. It is built to take on what the anglers want to take on. ​​​​​​​​Powerful, smooth and consistent drag. ​​​​​​​​​Provides anglers with ample control overcasts. ​​​​​​​​​​Good quality builds and finish. ​​​​​​​​​​A bit pricier than other spinning reels. ​​​​​​​​​​Might be made of plastic parts or completely of plastic. If you want a big and strong spinning reel this is the one. Apparently, this reel is said to be extra tough with a strong aluminum flex-free body. Then, there is the drag system featuring 10 carbon fiber, aluminum, and stainless steel washers. This will let you cast very smooth and also dissipate the heat. Apparently, it will sensitive enough to provide you with the right signals. With a gear ratio of 4.7:1 you get a good speed as well. This reel not only looks great but also has a good capacity. In fact, you can wire 50 lbs of braided line comfortably on it. Then, you get to fight and capture the big fishes without any trouble. The overall build is very strong and durable so you do not have to worry about the exposure to sea damaging it. Just be aware and use it properly to get the best results. ​​​​​​​​Features a strong aluminum flex body that lets you deal with the tough sea fishes easily. ​​​​​​​​The drag is made of good quality materials making it durable. ​​​​​​​​​​You also get to cast far, smooth and easy with the drag system. ​​​​​​​​​​The bail rusts over time. The first and foremost thing you can do to do anything better is knowing yourself. In this particular case, you have to know about the species you plan to go after. The reason is that the weight and size of the species you plan to capture affects the type and size of reel you need to buy. If you do not consider the species, you will rarely be able to capture it with a reel that does not even have the capacity to capture it. The problem with surf fishing is the rough environment of the sea. You might enjoy it but the wrong reel won’t be able to stand it. There is the saltwater that causes more damage and with it the salty air too. Therefore, you must make sure that your reel is made of a material that can help it take on the roughness. 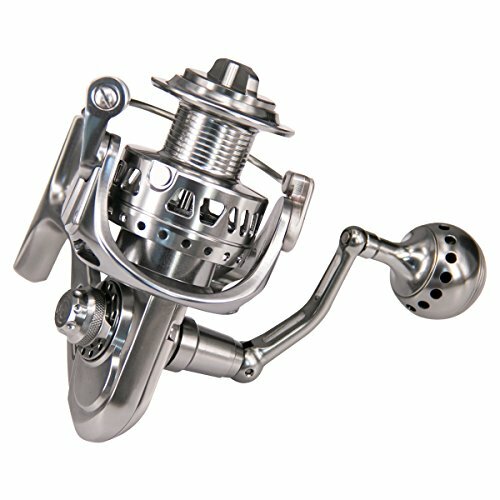 In fact, the best materials for a surf fishing reel will be anodized aluminum, stainless steel, and stamped aluminum. These are considered best because they are the most corrosion-resistant. Apart from that, carbon fiber provides you with strength and durability as well. While aluminum reels will give you’re a strong feel and ability to use powerful drags, graphite will help you in other ways. Graphite reels are lighter which make them easier for you to maneuver. Therefore, it depends on you whether you want strength or ease of control. Whatever it is, just make sure the reel will be durable enough to handle the sea things. There are not many options for you to choose from actually. So, the task is not very hard. It mostly depends on your skill level which reel you will enjoy using. So, there is the baitcasting reel and the spinning reel. Most beginners prefer spinning reels because they are easier to cast and control. On the other hand, intermediate level anglers usually prefer baitcasting reels. Baitcasting reels require a bit of skill to be controlled. It is not as easy to cast and control as a spinning reel but does offer advantages over it. You can cast further and fight better with baitcasting reels. However, your performance depends a lot on your skills and comfort. Therefore, it is better to perform best with any reel that you have a better grip on. Do you ever use a thin thread to hand a clock? No. Because the clock will fall and break and the thread will tear too. Similarly, you cannot use a reel that does not have the capacity to deal with eight of the large species you are targeting. You probably already know the species you are after therefore to avoid silly matters like overload breaking your reel; find a reel that has the right weight capacity for the species you are targeting. Drag systems play an important role in surf fishing. The fishes in the sea are quite energetic, strong and most often large. You need some time to get them tired and a lot of strength to fight with them. The drag system is what provides you with both. Firstly, choose a drag system that has enough power to not disappoint you. Then, make sure that the drag system functions as smoothly as possible. You do not want the drag system to hand when you are in the middle of a winning fight against a fish. And, if it does lag you do not just lose the fish but the line too. Apart from that, if it matters to you, you should look for a drag system that is easy to adjust and control. All these will come in handy when you are amid an intense fight in the sea. You do not want to spend extra effort to keep your reel functioning at a normal speed. In order to keep your reel functioning as smoothly as possible, you should choose a reel that has at least four to five bearings. The more the number of bearings the more smoothly your reel will perform. You will have a good smooth control over it. However, make sure the quality of the bearings is good. Or else, they will just be an extra burden acting as parts that jam or fall out. The grip not only helps you fish for hours but also improves your control and skills. How? Well, a comfortable grip won’t cause fatigue. You can choose from lightweight materials like cork or durable ones like EVA foam. Then again, the handle should have a nice texture or other features that provide your hands with the strong control it requires. You have considered the weight of the species, the capacity of the reel, now it would be a shame to leave out the reel’s weight itself. The main factor that the reel’s weight contributes to is your comfort. You do not want your hands to hurt when you have been sitting there all day for the fish that is now so close to being your prey. Therefore, a lightweight reel will cause less strain on your hands and leave you waiting with more energy and comfort. However, there should be a good balance between the weight and strength. The weight should be so light that it interferes with the reel’s strength. As we mentioned that sea fishes are stronger than normal fishes and seawater is also stronger than normal water so surf fishing reels tend to be stronger than the normal reels. You can use it to fish sharks and other big sea fishes. ​It is not just the waves but the saltwater as well that creates obstacles when you are surf fishing. In response to this, surf fishing reels are usually corrosion resistant. Considering the amount of time the reel has to spend in saltwater. 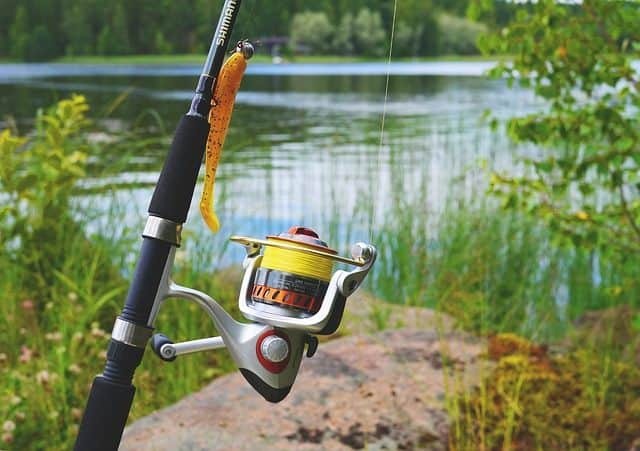 ​The main reason that you should use a surf fishing reel for surf fishing is the durability of the reel. Normal freshwater reels will not be able to handle the rough environment of the sea for very long. So, surf fishing reels have special features like sealed bearings and many others to stay durable while being exposed to seawater regularly. Q. How to choose the size of the reel? Answer: The size you choose basically depends on what weight and length of line you want to work with. Apparently, the size of the reel will be marked either in four digits or two, both of which imply the same size. You can choose a reel marked 1000-3500 if you want a small reel that can handle 4-14 lbs. of line. If you want a medium sized one you can select 4000-5500 class of reel which can handle 8-24 lbs of line. Lastly, you can choose from the 6000-9500 range which will allow you to deal with lines weighing 12-30 lbs. The stronger and vital your requirements, the more effort you need to put in finding them. For now, you know what you should look for in reels and what makes them best. Now, decide what features you cannot do without. Then, look for the reels that have these features in the best form. Only then will you be able to have the best surf fishing reel in your hands. So, be as cautious as you need to be to have the fun you want to have.